Keith John Kingston Roberts was a British science fiction author. Several of his early stories were written using the pseudonym Alistair Bevan. His second novel, Pavane, which is really a collection of linked stories, may be his most famous work: an alternate history novel in which the Roman Catholic Church takes control of England following the assassination of Queen Elizabeth I. Roberts wrote numerous novels and short stories, and also worked as an illustrator. His artistic contributions include covers and interior artwork for New Worlds and Science Fantasy, later renamed Impulse. He also edited the last few issues of Impulse although the nominal editor was Harry Harrison. In later life, Roberts lived in Salisbury. He was diagnosed with multiple sclerosis in 1990, and died of its complications in October 2000. Obituaries recalled him as a talented but personally ‘difficult’ author, with a history of disputes with publishers, editors and colleagues. CLICK HERE FOR MORE TITLES BY KEITH ROBERTS. 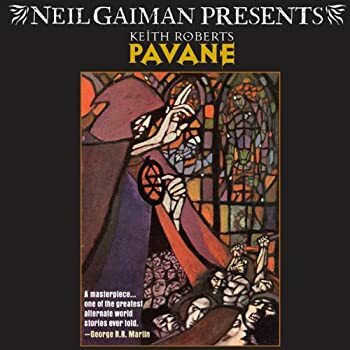 Pavane, by Keith Roberts, is a beautiful collection of six connected stories written in an alternate England where Queen Elizabeth was assassinated and Philip II won the throne of England. The Protestant Reformation never occurred and Europe, as well as the New World, fell under the control of the Pope. Now it’s 1968 and because the Roman Catholic Church has held back technological advances from the people, the English still live in a feudal society complete with candlelight, castles, moats, monasteries, and much superstition, though the Church has allowed some steam-powered vehicles and the use of semaphore telegraph lines for communication. The Church has electricity, people know they have been repressed, and there are rumors of revolution.